It's pretty good being a foodie in Midlands. From countryside farm shops to the vibrant cities, there are so many amazing flavours to whet your appetite. Melton Mowbray in Leicestershire is the home of the pork pie, you can find Colston Bassett Stilton in Nottinghamshire and Bakewell tarts in Derbyshire's Peak District. From beers in Burton-on-Trent to baltis in Birmingham, there's a lot to be said about the food and drink around these parts. So when Haven asked me to share a local delicacy, I was spoilt for choice. In the end I went with classic Red Leicester; the infamous orange cheese which dates back to the 17th Century. It's found in supermarkets far and wide, but to get the proper hard, crumbly but creamy Red Leicester it needs to be traditional Sparkenhoe. To celebrate this fantastic Leicestershire cheese, I've created a Red Leicester bread - perfect accompanied with some local homemade chutney! Milk and cookies; the perfect combination. Just like tea and toast, cheese and wine and jam and scones, this American tradition goes together like peas and carrots. One of the latest foodie trends though is mixing sweet and savoury in baking. Like salted caramel, sea salt with chocolate can add a little extra flavour and texture to sugary bakes. Inspired by America's famous Sweet Corner Bakeshop and their sea salt chocolate chip cookies, I've created my own recipe featuring a duo of sea salt and dark chocolate. Warmed up and slurped down with a glass of milk? Perfection! Risottos, biryanis, arancini, sushi and paella... delicious dinner ideas all with the same ingredient. Rice! To celebrate National Rice Week (19th to 25th September 2016) I've teamed up with Love Rice to bring you a tasty new recipe to embrace those everyday little grains. It was a tough choice, what with being a sushi fiend and lover of paella, but I've gone for a risotto. 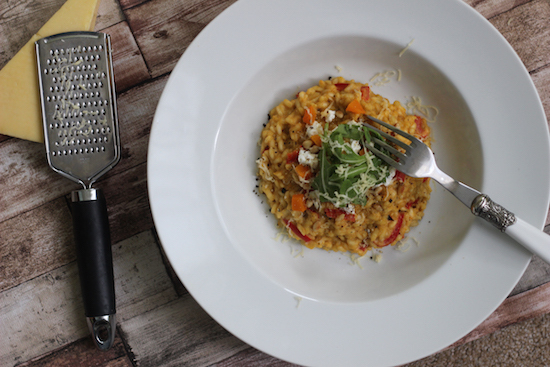 An Autumnal inspired dish, I've paired the earthy flavours of roast butternut squash with sweet red peppers, creamy goat's cheese and peppery rocket to create a comforting risotto recipe. hellofresh: chefworthy dishes delivered to your door. So this month HelloFresh are celebrating the brains behind the beautifully thought out menus each week... their resident chefs! This particular Top Chef recipe was Roasted Curried Parsnips with Cumin Quinoa Pilaf and Pomegranate Seeds and featured in their most recent vegetarian box. indulge in häagen-dazs salted caramel ice cream stick bars. A rich and indulgent addition to the Häagen-Dazs collection. Whoever said September is too late to enjoy ice cream clearly hasn't tried one of these yet. These sumptuous salted caramel stick bar ice creams from global brand Häagen-Dazs are made up of salted caramel swirl ice cream and flecks of caramel brittle before being smothered in milk chocolate. Who could resist? A homemade raspberry and rosewater jam, created using Tate & Lyle's Fairtrade jam sugar. The 1:1 jam is specially created to make a traditional jam that uses 1kg fruit to 1kg sugar. With blackberry, summer berry and strawberry and Prosecco making up their lovely recipe ideas, I opted for raspberry and rosewater. A fruity and fragrant mix, the recipe proved to make a really thick and chunky jam which kept the raspberry seeds intact. And what's more, it was so much more simple than I expected. For fresh seafood overlooking Marseille's Vieux Port, La Marinière is a must. Showcasing the likes of moules frites, bouillabaisse and seasonal seafood platters, La Marinière can be found along the Quai des Belges amongst the hustle and bustle of the busy French port. I went along a couple of times during my stay in the South of France, both times enjoying some great quality fish dishes at pretty reasonable prices. An indulgent vegan curry featuring the unique Rooster potatoes from Albert Bartlett. Their signature potato has unmistakable deep red skin and a texture that makes them perfect for mashing, boiling, baking and roasting. To celebrate this fantastic potato, I've teamed up with Albert Bartlett to create this Thai inspired curry with hints of peanut, chilli, lime and coriander. The potatoes are the star of the show, with added nutrients from the finely chopped spinach throughout.